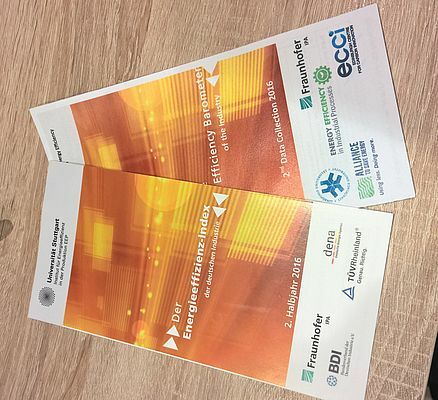 The Institute for Energy Efficiency in Production (EEP) at the University of Stuttgart, semi-anually computes the Energy Efficiency Barometer of the Industry, in collaboration with Fraunhofer IPA, Energy Efficiency in Industrial Processes (EEIP), Linköping University, the Edinburgh Centre for Carbon Innovation (ECCI) and the Alliance to Save Energy. 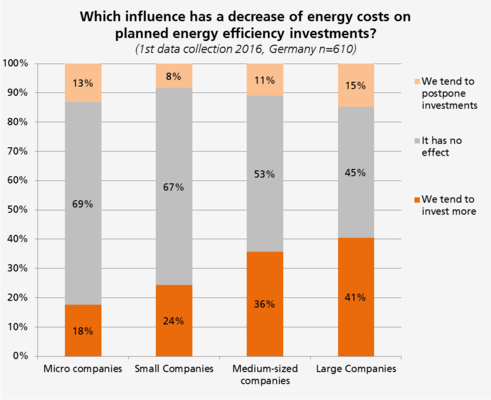 The Barometer sheds light on the current state of energy efficiency in the producing industry and allows a look into the future regarding importance, investment and productivity. The special issue questions further capture companies’ views on current topics. 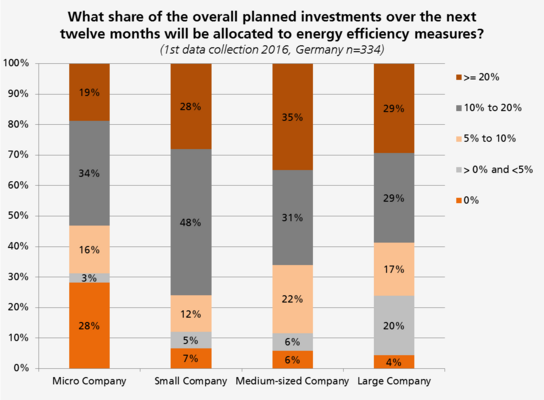 For the seventh time, the Institute for Energy Efficiency in Production (EEP) is currently taking the pulse of companies: With the Energy Efficiency Index of the German Industry and (international) Energy Efficiency Barometer of the Industry it describes a path for evidence-based decision-making in companies, for policy makers and financiers. • Where their company stands compared to others. The previous data collections have brought up valuable information on barriers, on gaps, on fundamental differences across sectors and company sizes. With the sector specific analysis subscribing participants receive, companies can compare themselves with developments in their economic sector and derive strategies to accelerate the company’s energy productivity. This is of high relevance, as more than half of the CO2 emissions that need to be avoided additionally to commitments countries already made in Paris, occur in the industrial sectors. To make such energy productivity gains possible, it is essential to switch from ‘watering can’ approaches to ‘understanding the demand side’ tailored approaches. Shaping policies, concepts and business models that take account of the needs, the values and the realities in varied industrial sectors is something, the Energy Efficiency Index of the German Industry builds the foundation for: by reflecting businesses’ perception regarding energy efficiency and existing (or lacking) policies. With its sub-indices ‘importance’, ‘investment’ and ‘energy productivity’, the index also allows specific comparisons across economic sectors and company sizes. With the Barometer, this systematic is currently extended on to further countries and prepares ground to objectively assess, inform and accompany efforts to accelerate the level of energy efficiency as a whole. Previous results have shown that size indeed matters in many aspects, but it is not always the big companies that are the driving force. 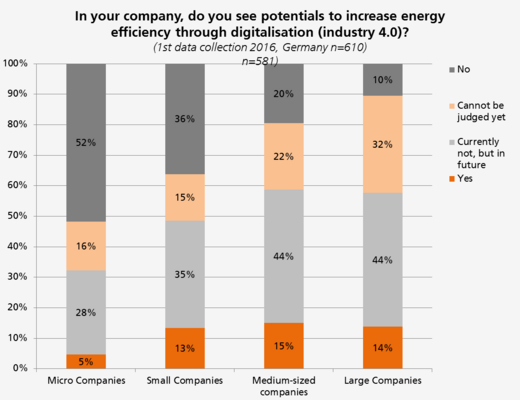 Do companies see energy-related benefit for themselves in sectoral coupling, flexibilisation and digitalization? How can transaction costs and risks be reduced? How do implemented measures actually perform? 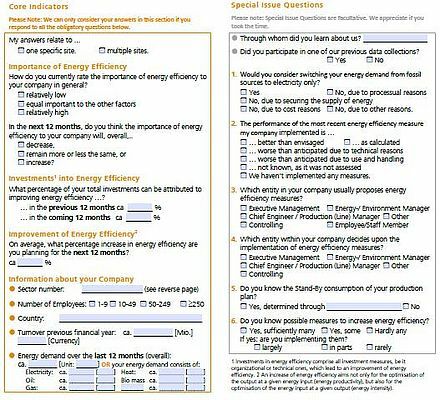 All these are questions the Energy Efficiency Index is designed to find answers for, based on data from hundreds of producing companies, to find tailored policies, concepts and business models to prevent climate change and to accelerate energy productivity. The results of the data collection will be published in early 2017 and predominantly include aggregated data.